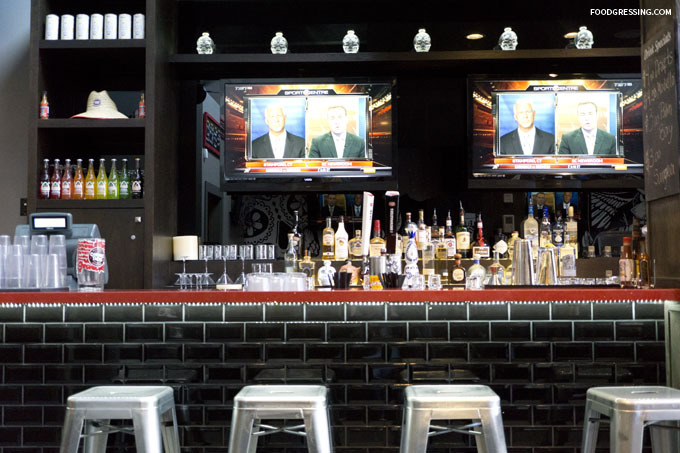 Patron Tacos & Cantina in the Stadium District serves traditional Mexican fare in a lively, casual environment. 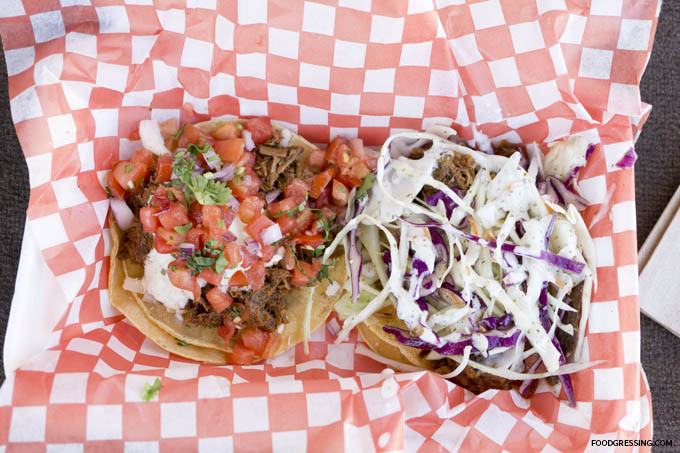 I had come to know about Patron Tacos by way of their participation in Vancouver Foodster events. 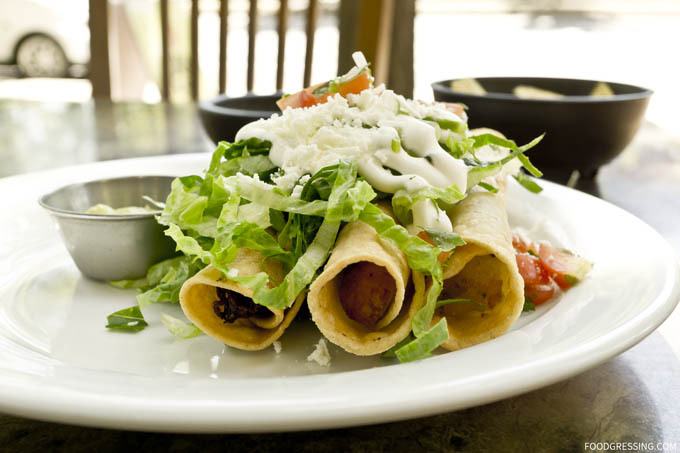 On their menu are traditional Mexican dishes like enchiladas, huaraches, quesadillas and more. 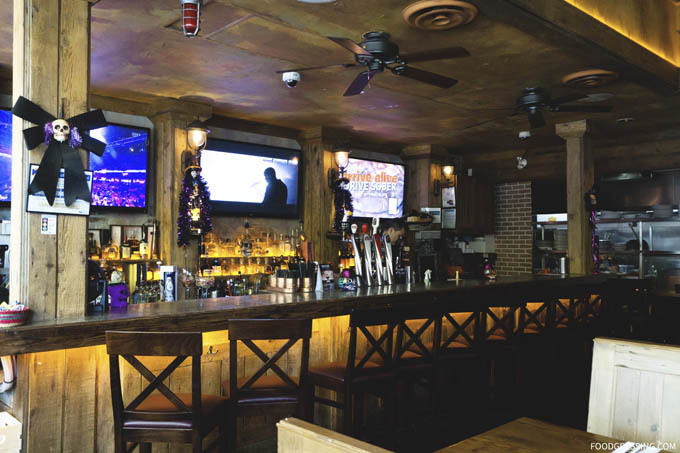 The bar features a range of Tequilas, cocktails and speciality margaritas. 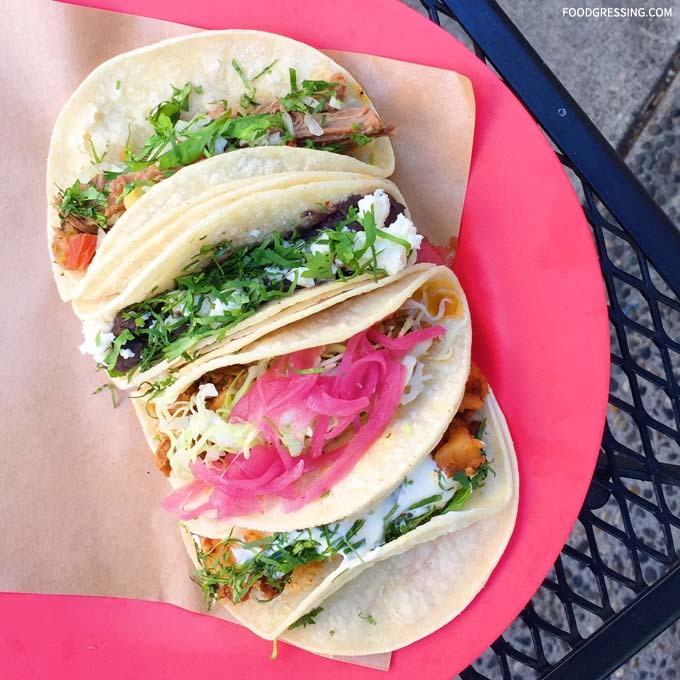 Here are some thoughts on my visits to Patron Tacos this year. 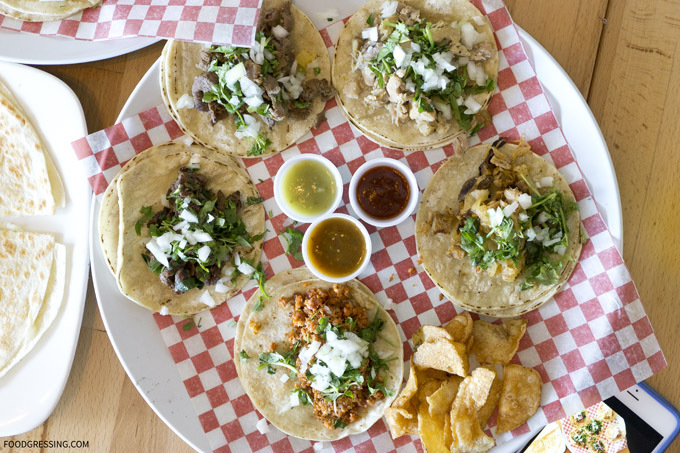 My first visit to Patron Tacos was as a guest of Hanson of Nosh and Nibble as he was a media judge for Vancouver Foodster’s Taco Challenge. Patron Tacos was one of the participating restaurants. 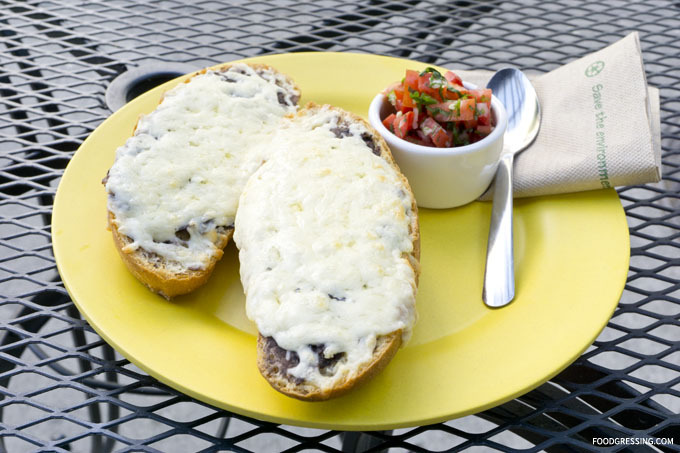 The weather was nice that day and we enjoyed our meal on their outdoor patio. Complimentary chips and salsa were served after ordering. 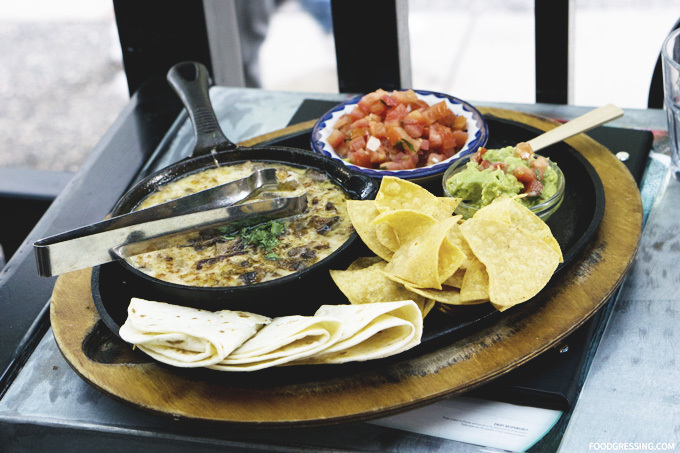 Compliments of the chef, we tried their Queso Fundido ($17.50) featuring iron cased melted cheese with choice of corn or flour tortillas. 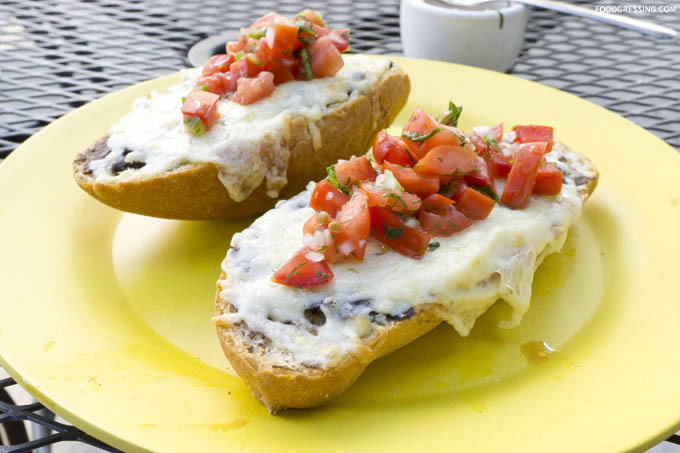 I’m a fan of La Mezcaleria’s version which is loaded with a lot of cheesy goodness. 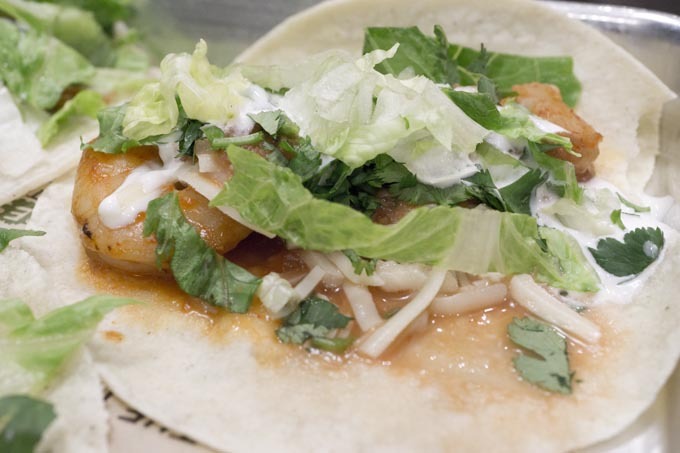 However, Patron Tacos’s is quite good as well though not as intensely cheesy. 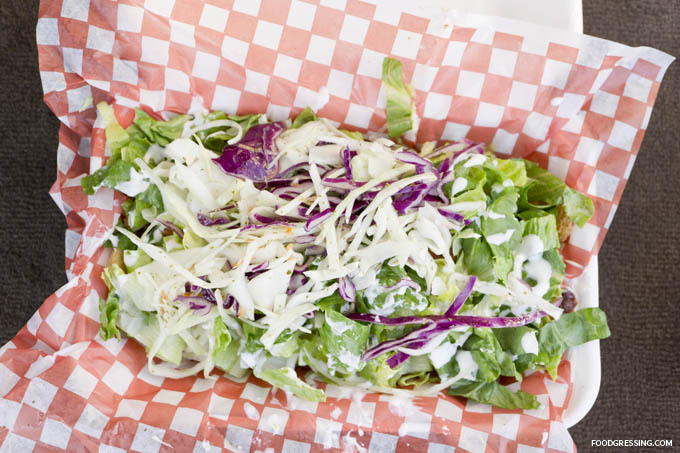 Afterwards, we tried the Passion Taco, the participating taco for the Vancouver Foodster challenge. 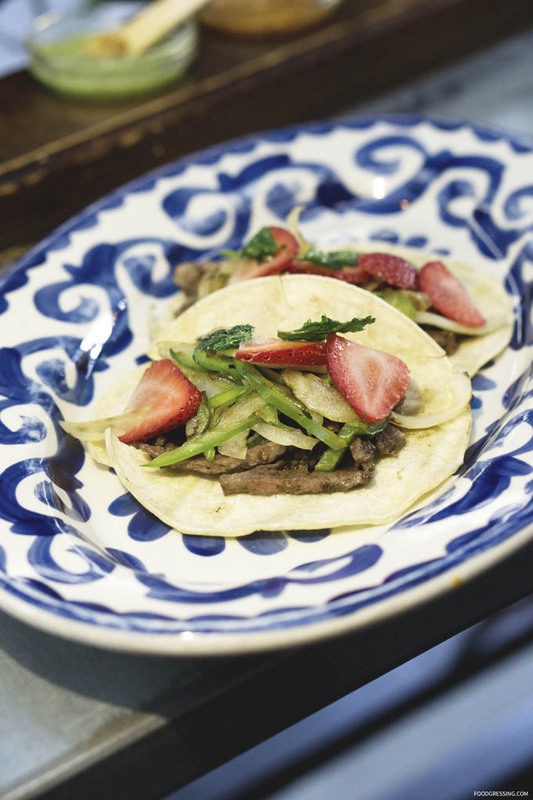 This creative taco featured tender rib eye steak, freshly cut strawberries sautéed with caramelized onions and thin slices of jalapeño. 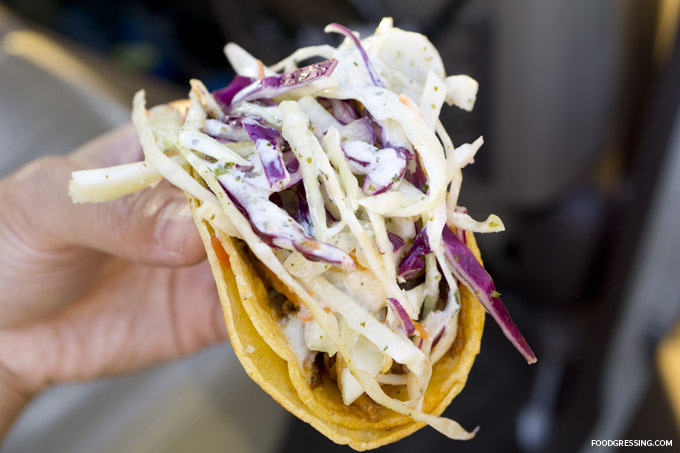 I was quite impressed with the balance of sweet and savoury flavours in a single taco. The rib eye steak was nicely tender and the sweetness from the strawberries was not overpowering. I quite enjoyed the fun mix of taco ingredients which is not outside of the normal flavours. 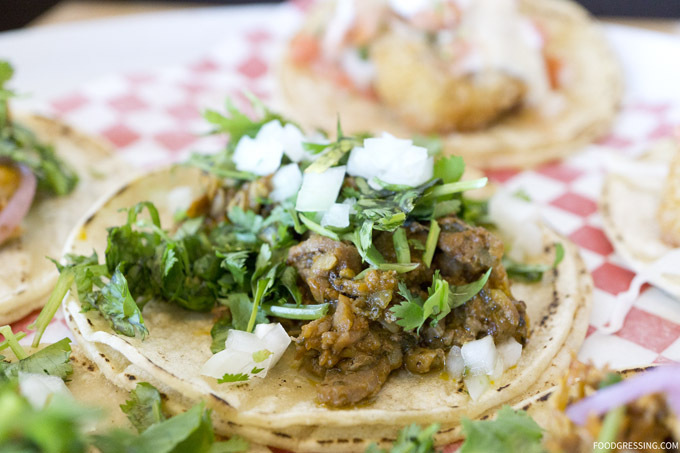 I revisited Patron Tacos again today as part of Vancouver Foodster’s Tasting Plates Yaletown Brunch. This time, I had their Red Chilaquiles which is an item specially created for the event. 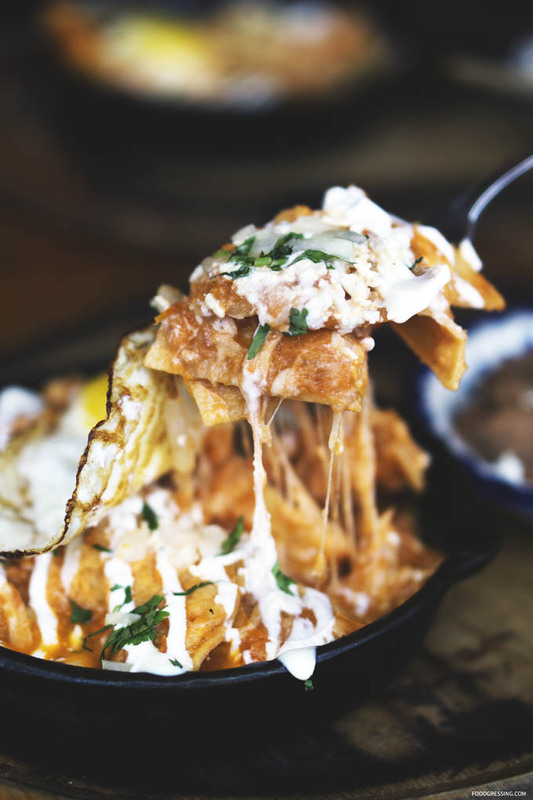 The skillet contained fried corn tortilla chips dipped in red tomato sauce, mixed with melted cheese, sour cream onion, cilantro and topped with a fried egg. This was served with a side of red fried beans. I was appreciated the heartiness of the dish, the subtly spicy flavours, and of course, the cheese. The cheese was melted throughout and there didn’t seem to be any parts of the dish that were shall we say, cheese-less. 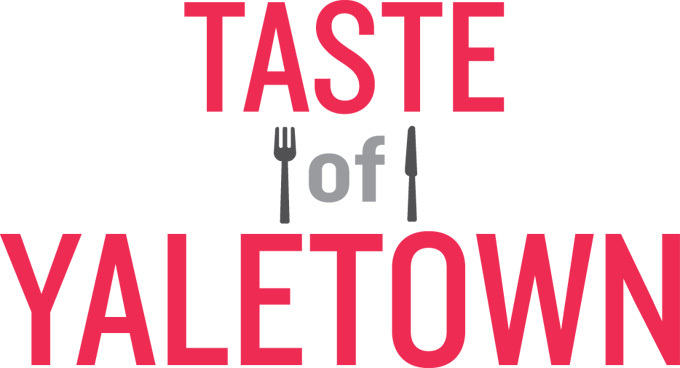 Vancouver’s favourite foodie event, Taste of Yaletown, is now on until Oct 27th. Presented by the Yaletown Business Improvement Association, the 13th annual Taste of Yaletown is a popular community-based event that invites the public to try a variety of dishes from 26 premier restaurants throughout the neighbourhood. 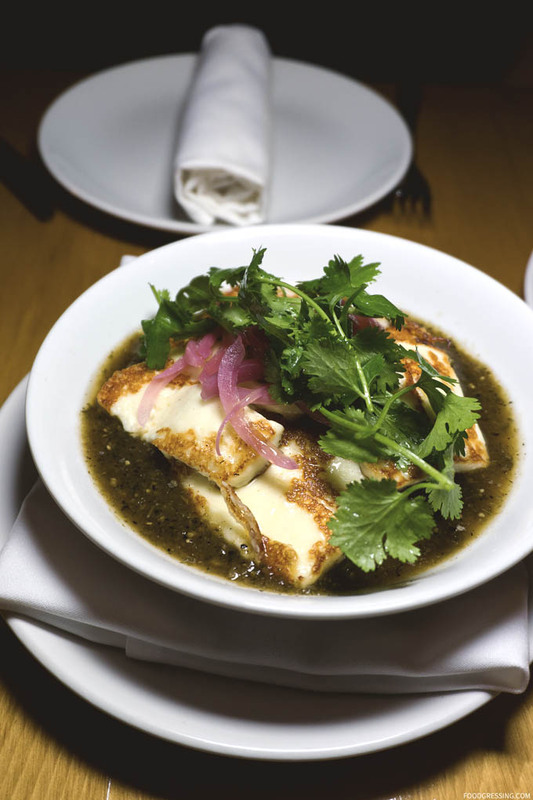 Participating restaurants are offering innovative pairings and special menus with set prices of $25, $35, and $45. 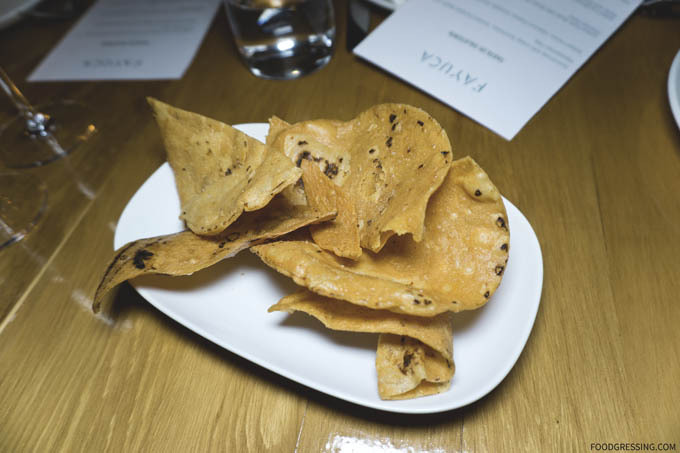 Last night, I had the opportunity to try the participating menu from Fayuca, a newcomer to Yaletown’s dining scene. 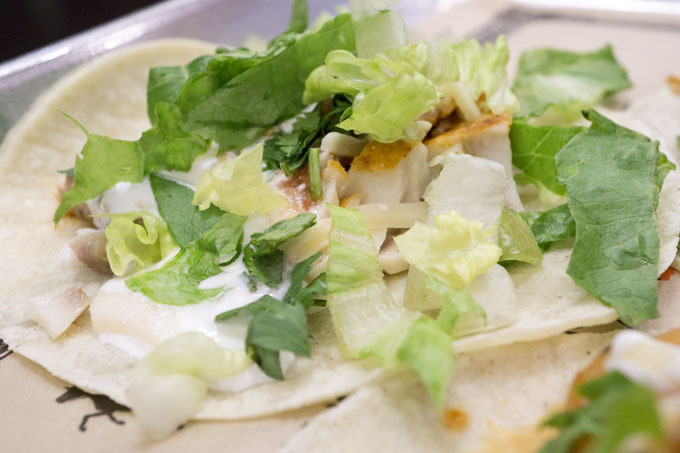 Fayuca opened this past summer and has been receiving a lot of positive reviews. 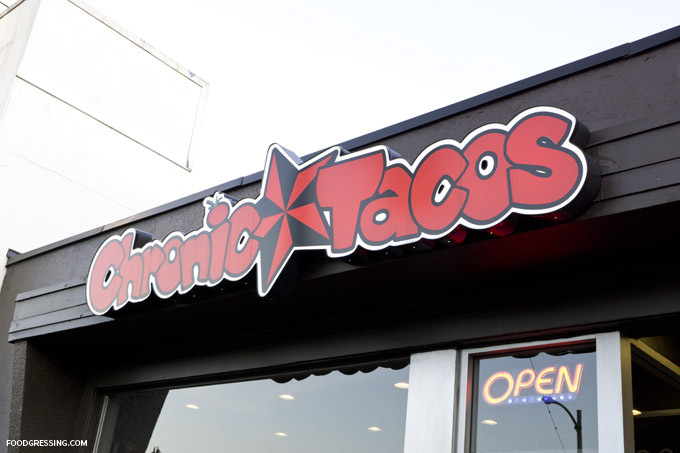 Their cuisine is Pacific Northwest Mexican which is rather unique to Vancouver. This year, they have been nominated by Air Canada’s Enroute Magazine to be one of Canada’s top new restaurants. 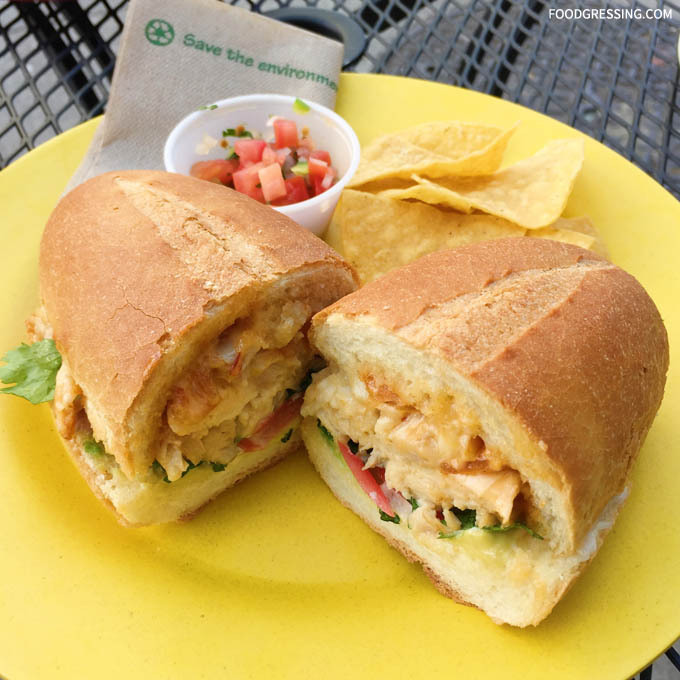 One thing to note that their Taste of Yaletown features are also on their regular menu. You really get a sense of what the restaurant is offering because of that. 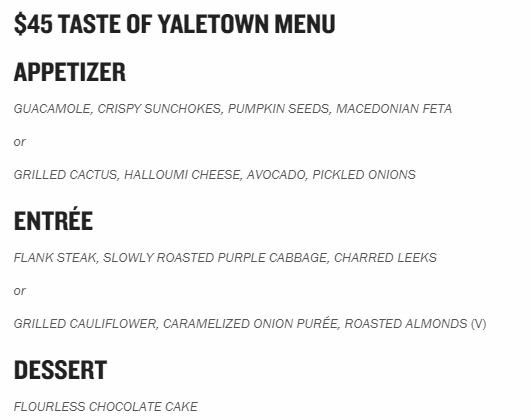 Here’s a look at what you can expect with their $45 Taste of Yaletown Menu. 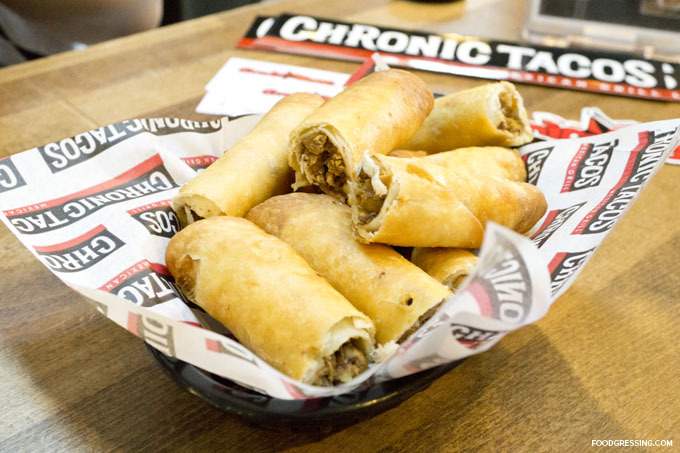 Diners are offered a choice of appetizers. 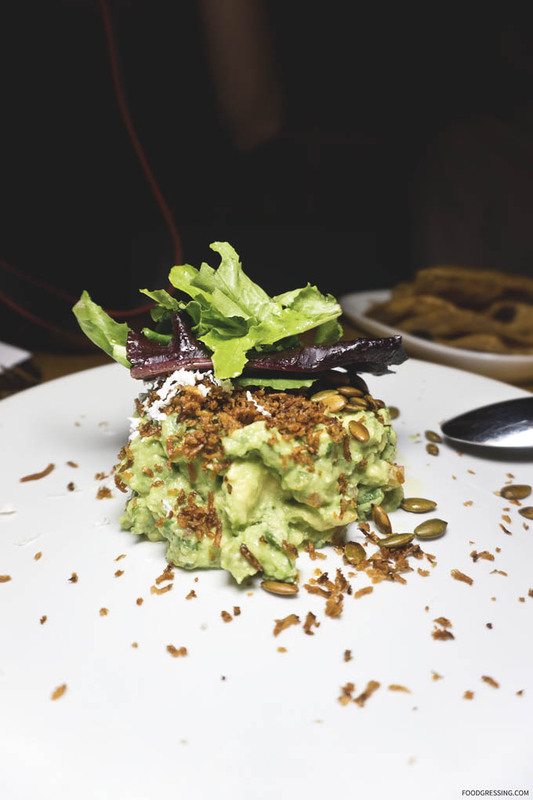 First is the Guacamole, Crispy Sunchokes, Pumpkin Seeds, and Macedonian Feta accompanied by tortilla chips. The guacamole was oh-so-fresh, silky and smooth. The pumpkin seeds added some nutty flavours and textural contrast. The tortilla chips were *very* crispy and made the whole tortilla and guacamole experience ultra-indulging. The Grilled Cactus, Halloumi Cheese, Avocado, Pickled Onions seemed to be a very inventive savoury appetizer. It was my first experience with grilled cactus and I enjoyed it. The cactus was just a bit hard on the outside and soft on the inside. Its taste was similar to that of okra. The halloumi cheese was also a delight being soft and chewy. A very interesting dish. 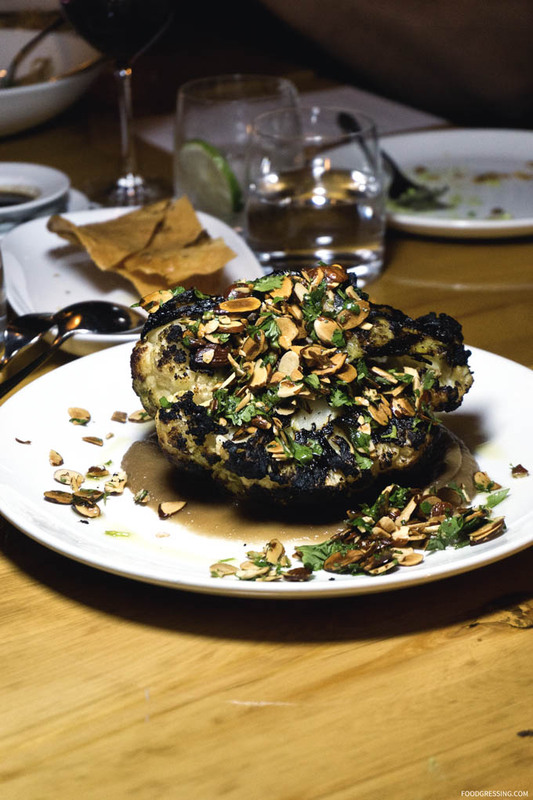 A vegan option available is the Grilled Cauliflower with Caramelized Onion Purée and Roasted Almonds. It appeared rather interesting at first sight for sure. As for the taste, it was a bit on the sweeter side with the onion puree. The roasted almonds added a lovely crunchiness to the dish. I personally am a little wary of eating burnt vegetables so I avoided those parts of the cauliflower. 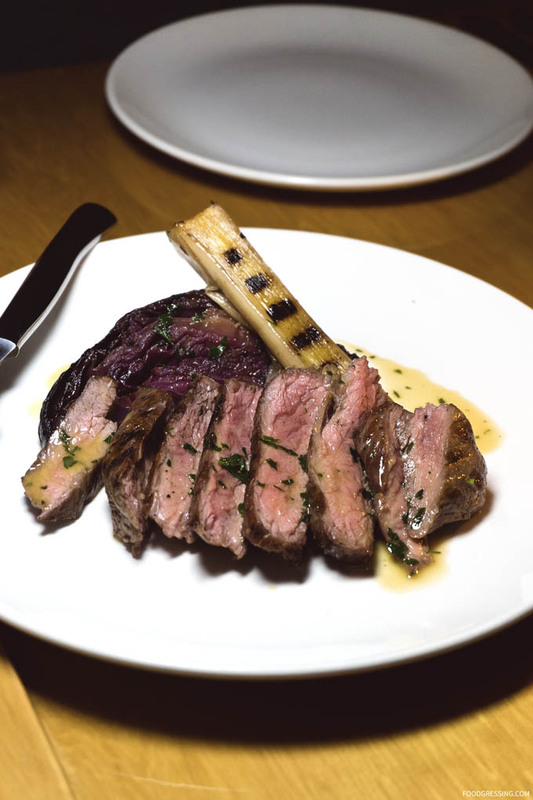 Meat lovers would certainly love the Flank steak which was wonderfully tender and juicy. On the side were slowly roasted purple cabbage and charred leeks. 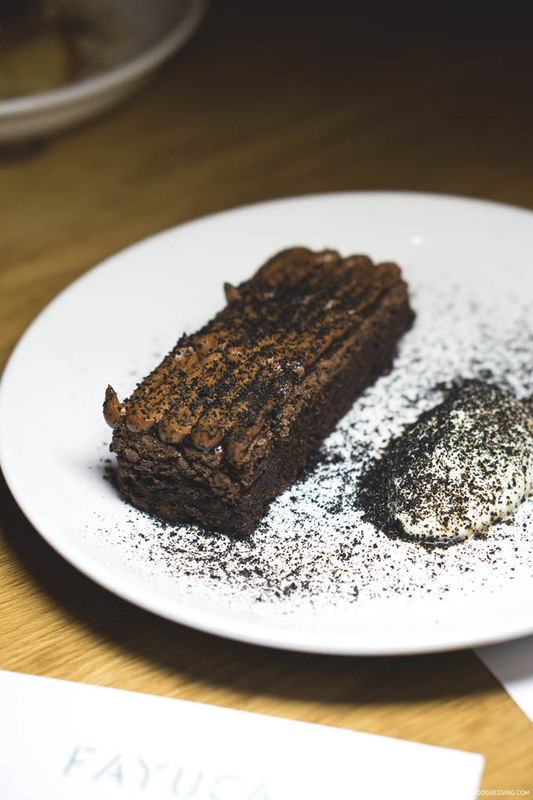 And for dessert, a moist, dense, rich (but not overly decadent) Flourless Chocolate Cake. 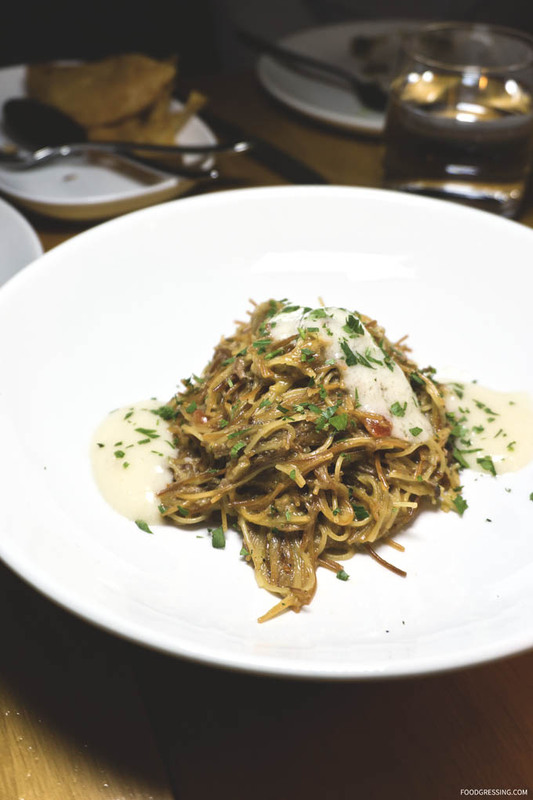 A dish that we tried that was not part of the Taste of Yaletown menu was the Oxtail Fideo Pasta with Pine Nut Picada and Aioli; it was insanely delicious. I mean, where have you been all my life? All the pasta strands were coated nicely with this lightly, sweet and subtly spicy sauce. You need to go Fayuca and try this now. Go. 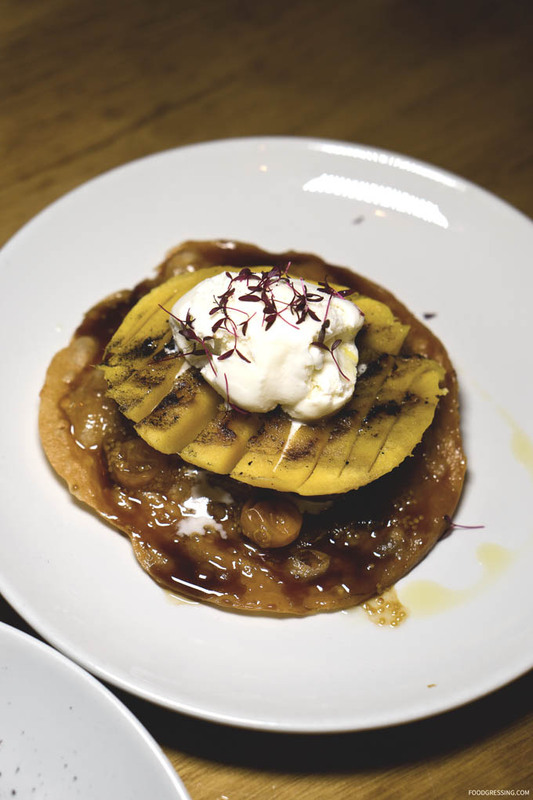 A very creative dessert that they offer is the grilled mango on caramelized torta and topped with ice cream. 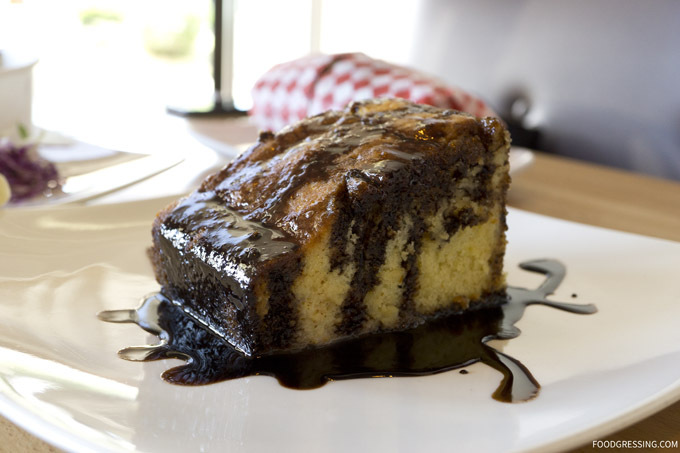 Lots of fun elements to this treat like a grilled mango, crispy torta and creamy ice cream. 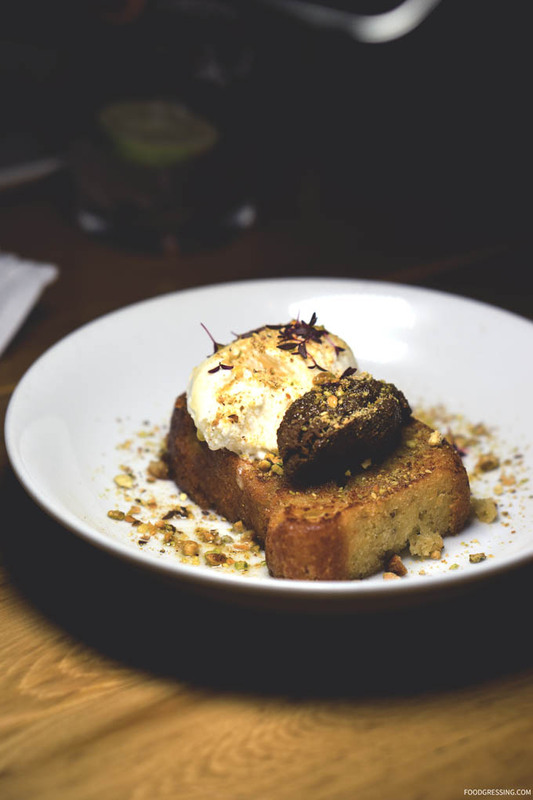 Fayuca seems to be a refreshing addition to Vancouver’s emerging culinary scene. 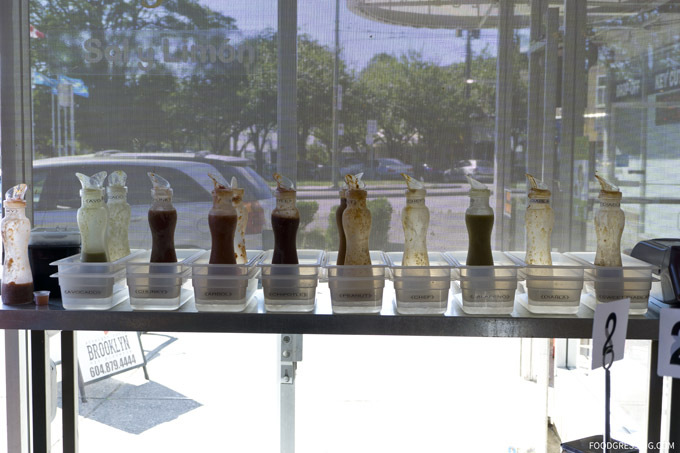 The dishes we tried were interesting, inventive and made me want to try more of their menu. I highly recommend their Taste of Yaletown menu but you’ll likely want to return to try more of what they have to offer. 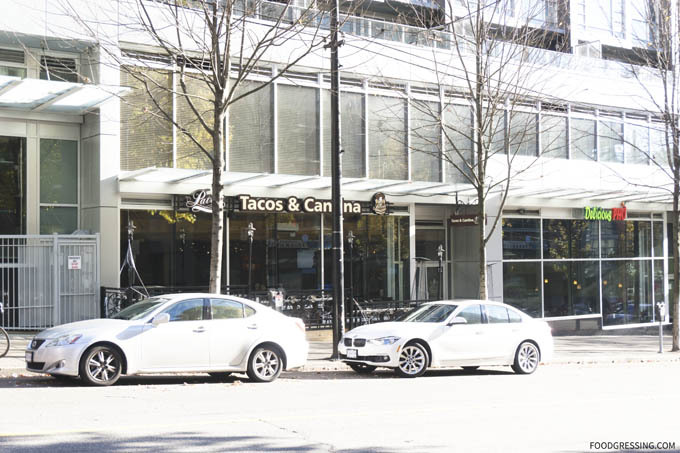 The intersection between Kingsway and Fraser is home to many popular Vancouver eateries. 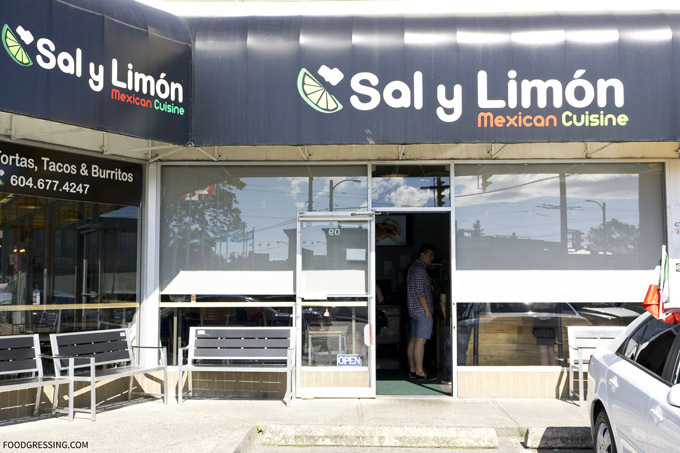 But one Mexican restaurant, Sal Y Limon, draws the crowds so much that they are famous for their line-ups. 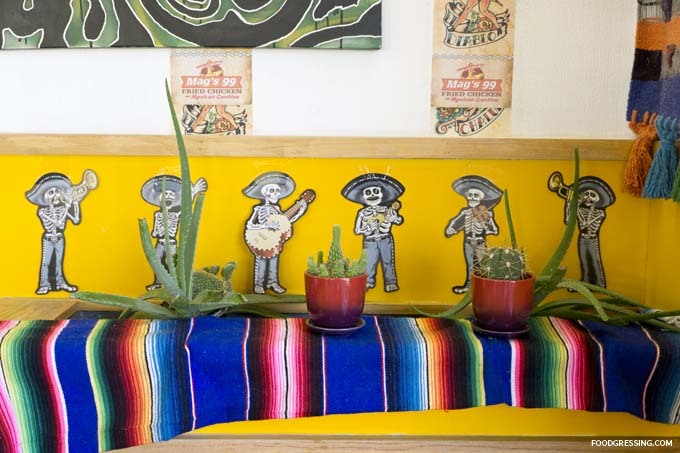 One lazy afternoon this past summer, my family and I ventured to Sal Y Limon for some hearty Mexican fare. We went during an off-peak time between lunch and dinner and there was still a small line-up. 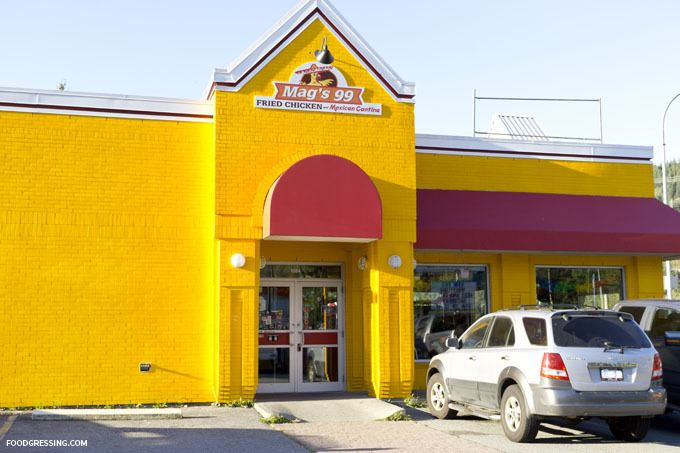 The restaurant is spacious and has a lively, welcoming atmosphere. There are lots of tables for different group sizes and counter seating by the window. 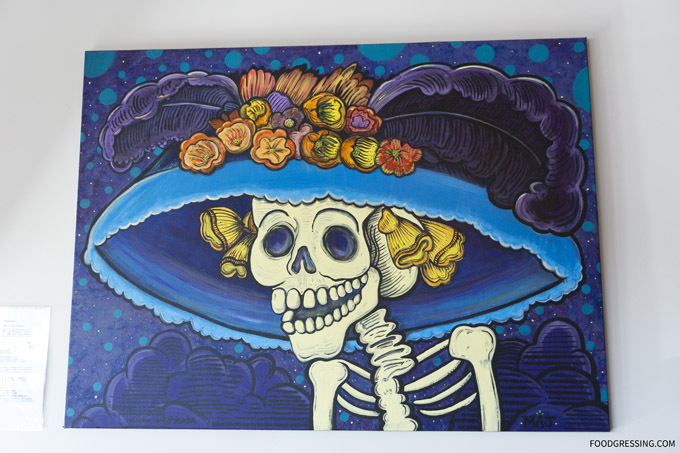 Along the walls, you’ll find some vibrant, eye-catching art created by local Mexican artists. I really like how these art pieces added to the atmosphere of the restaurant. 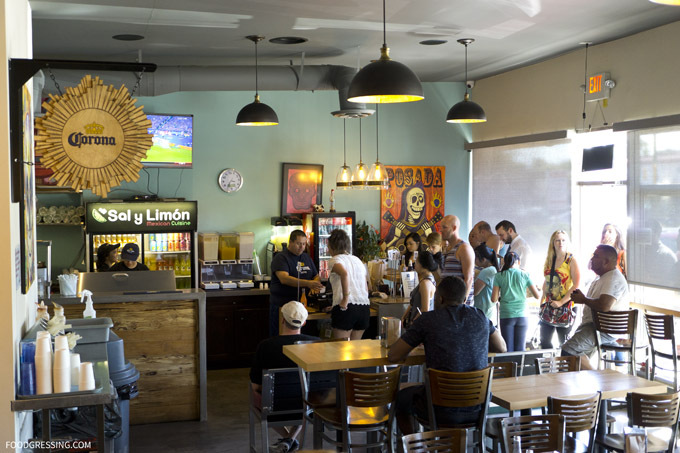 The owners of Sal Y Limon intended on the restaurant as a place where everyone would feel welcome. 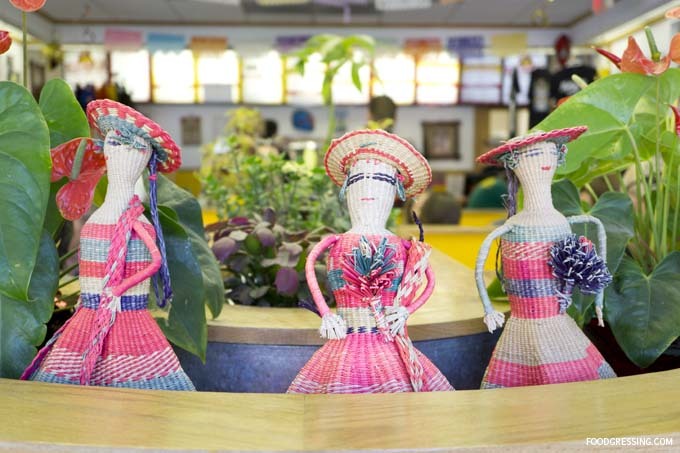 It has quite a community-feel and is very family-friendly. 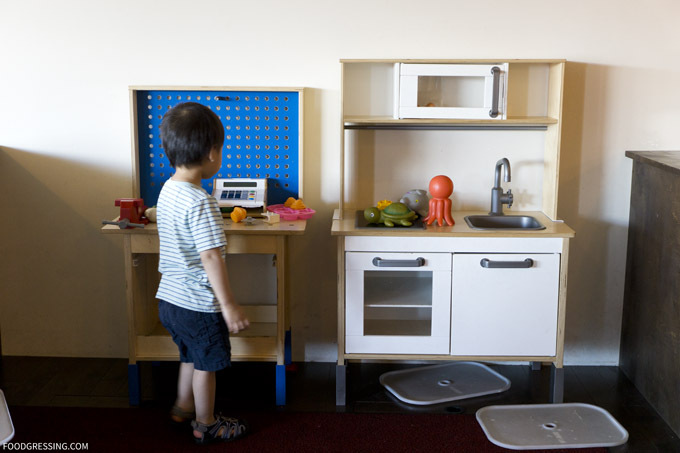 The little ones can enjoy themselves with a decently-sized elevated playing area that includes a play kitchen, workshop and other small toys. 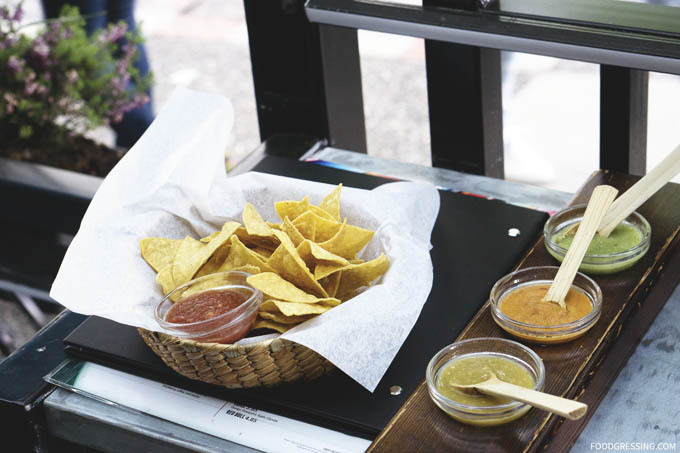 To enhance your meal, there is a self-serve salsa bar featuring salsas of different spiciness levels. 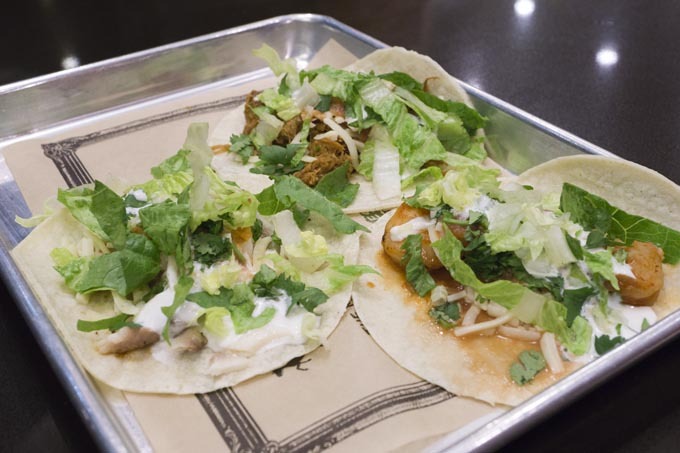 These include jalapeño, avocado, chipotle and more. 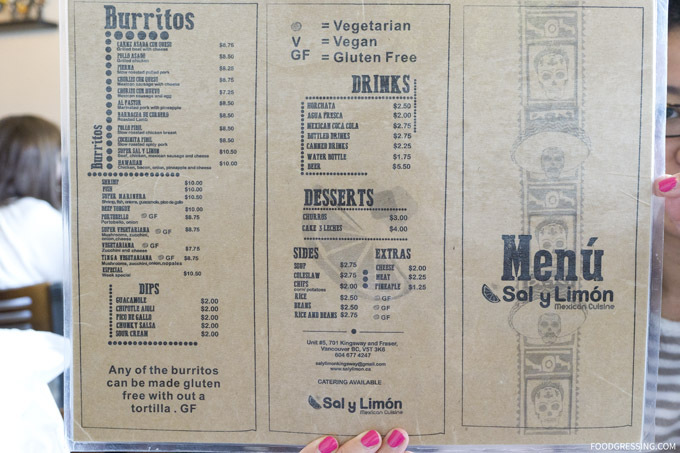 On the menu at Sal Y Limon are burritos, tortas, tacos, quesadillas, huaraches, taquitos and more. There are gluten free, vegetarian and vegan options available. 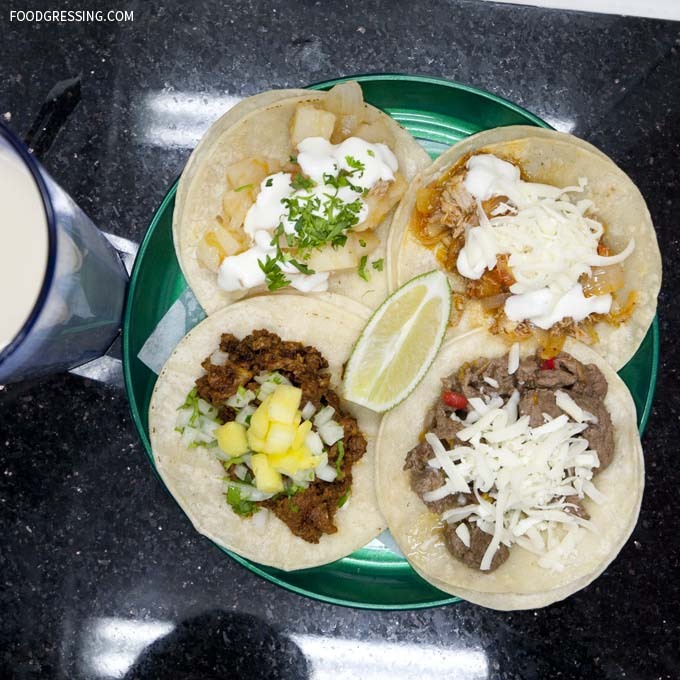 To wash it all down, you can get an authentic Mexican horchata. Dessert choices include churros and tres leches cake. A meal would probably cost you around $10 – $15 per person. 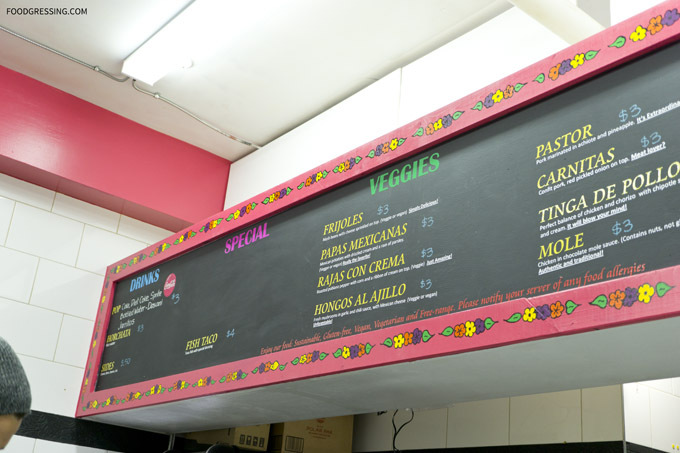 The menu is fully available online. 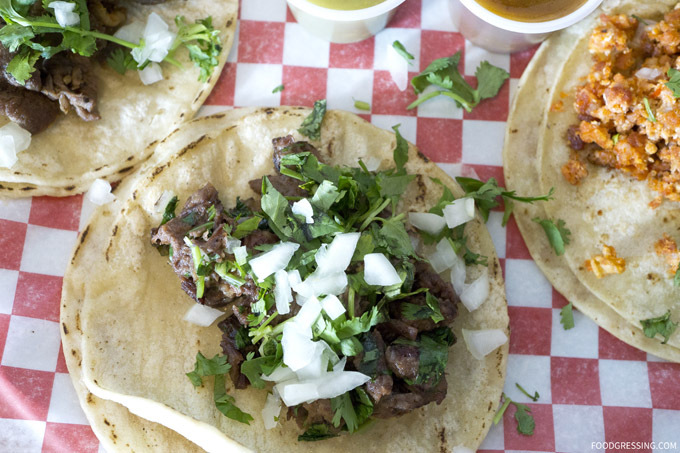 The tacos come as 4-inch corn tortillas with onions and cilantro. In general, I thought the tacos were very tasty. 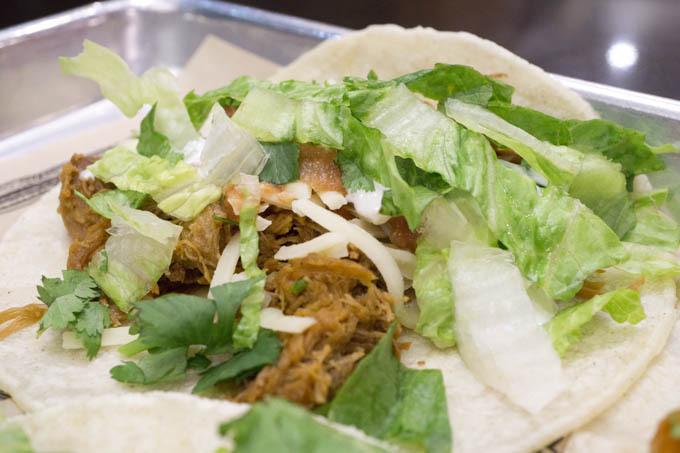 The tacos that stood out the most were the ones with slow-cooked meat: pierna (pulled pork), cochinita (spicy pork) and pollo pibil (chicken breast). These were more melt-in-your-mouth delicious. I recommend them. However, I didn’t particularly like the battered, deep-fried shrimp and basa. The batter was a bit bland and wasn’t particularly crispy. I would not order these ones again. 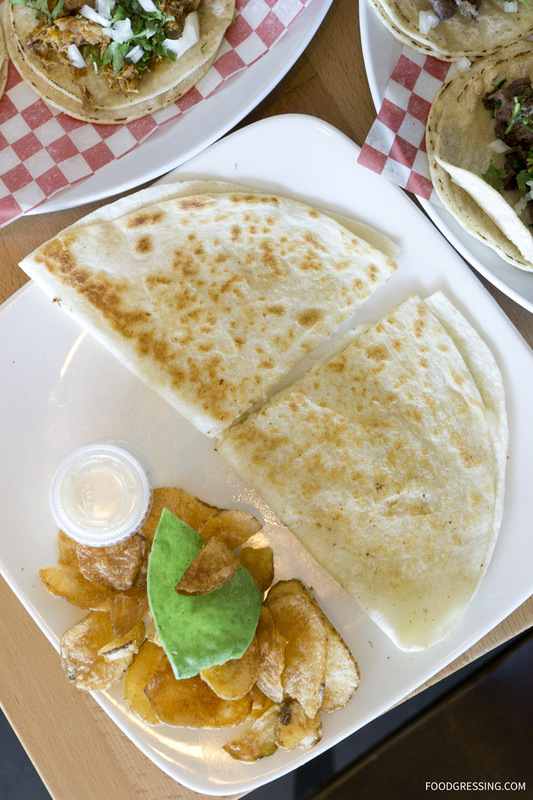 We also got a simple cheese quesadilla which comes on 10-inch flour tortilla. 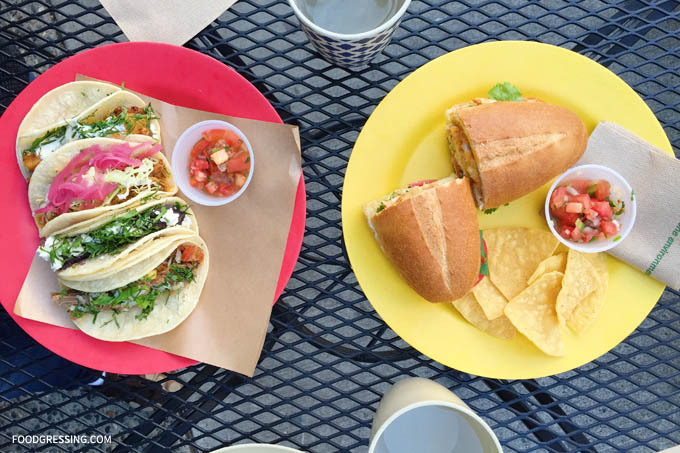 We combo-ed it up with a side of chips and drink. 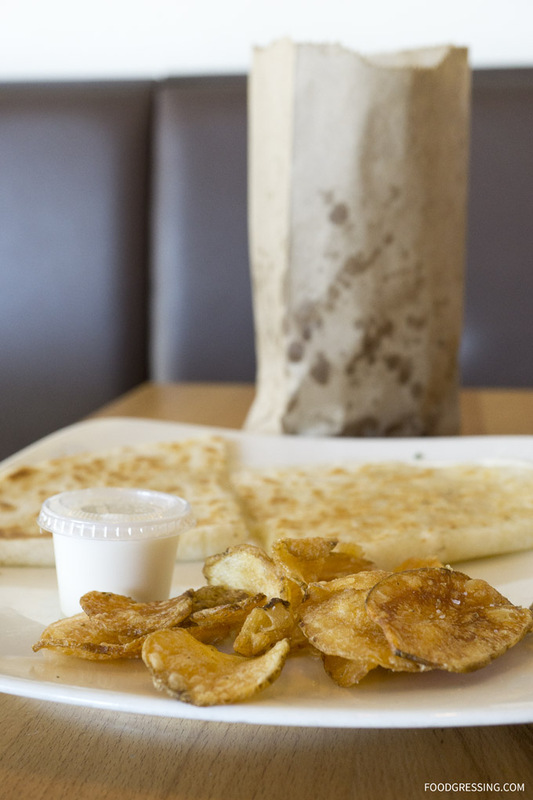 The quesadilla had appropriately melted cheese and the house-made chips were tasty but very greasy. As you can see from the photo, the chips were quite greasy! 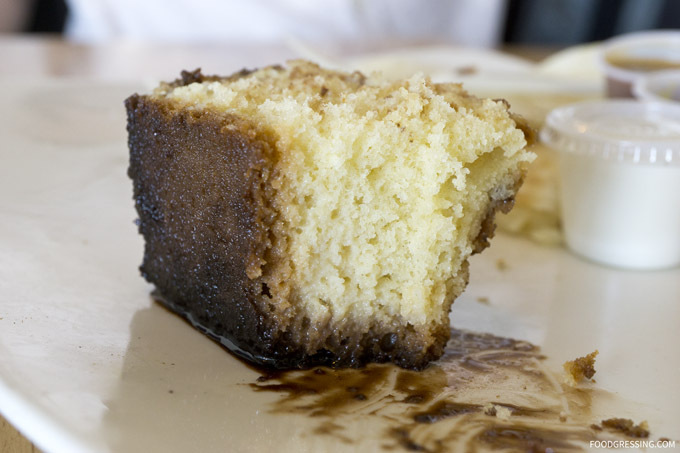 To finish off a delicious meal, we had a tres leche cake, which is traditionally a sponge cake that has been soaked in three kinds of milk: evaporated milk, condensed milk, and heavy cream. The cake was nicely moist but not soggy despite being soaked in milk. It’s really quite a decadent treat that is very sweet. 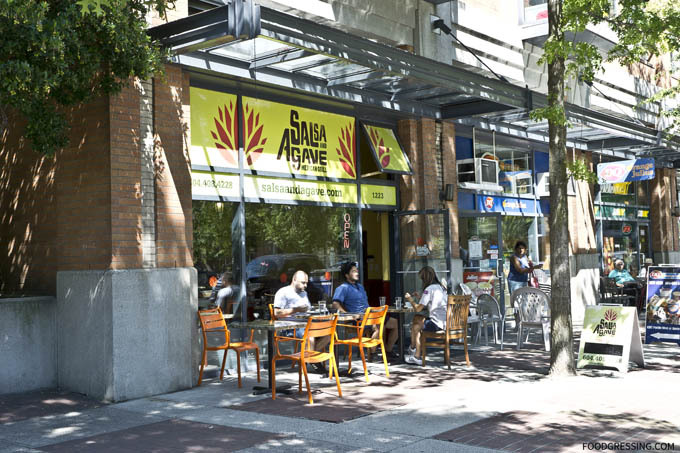 Salsa and Agave is a Yaletown Mexican restaurant that has been around for several years now. 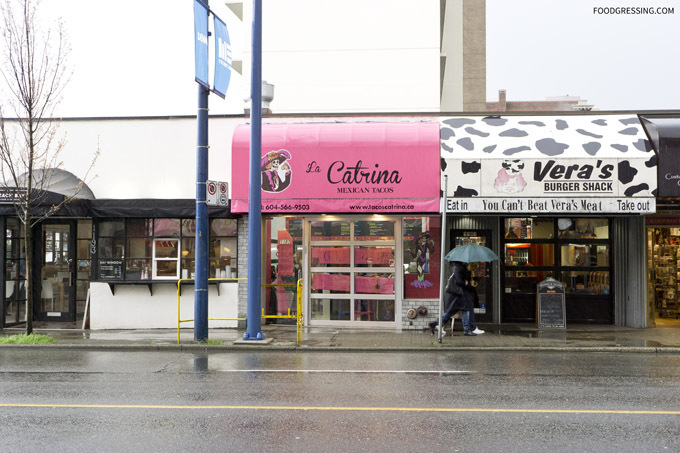 They occupy two locations on Pacific Boulevard between Davie and Drake: one is a full-service sit down restaurant and the the other is a take-out counter. 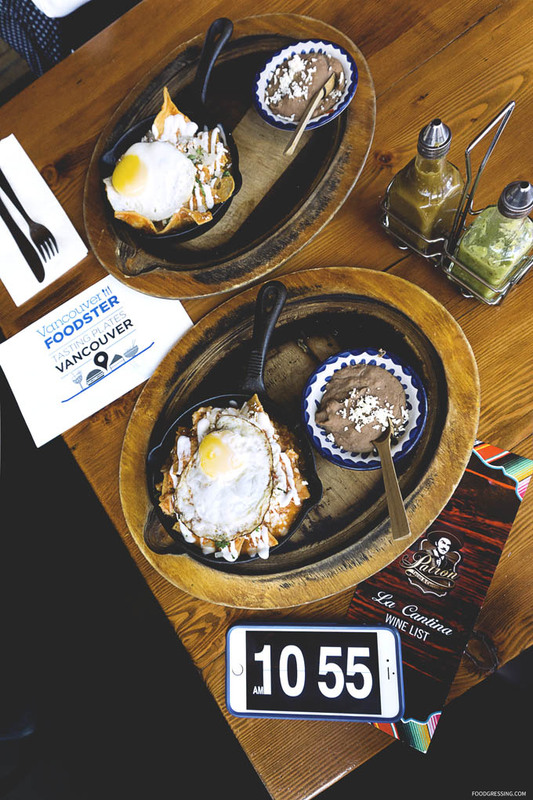 They’re the only eatery in the Yaletown area serving Mexican cuisine with blockmates being Little Saigon and DD Mau. Based on other people’s reviews, I get the impression that their food is somewhere in between authentic but not quite Tex-Mex. This last summer, I visited their takeout counter on two occasions, which is only open Monday to Friday during lunch hours. 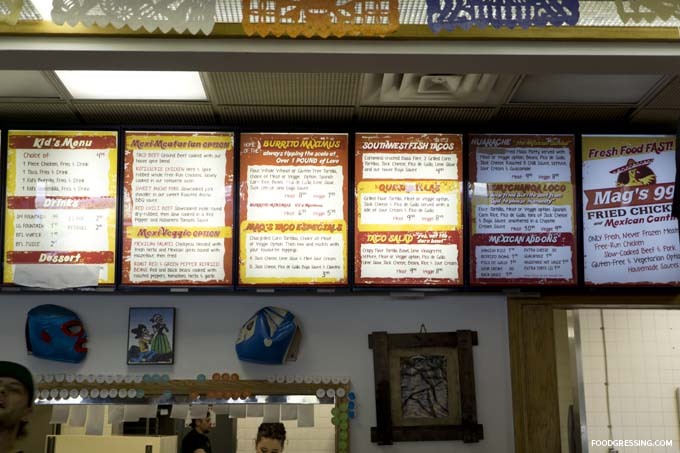 The takeout menu looks to be more or less the same as the menu at their sit down restaurant. 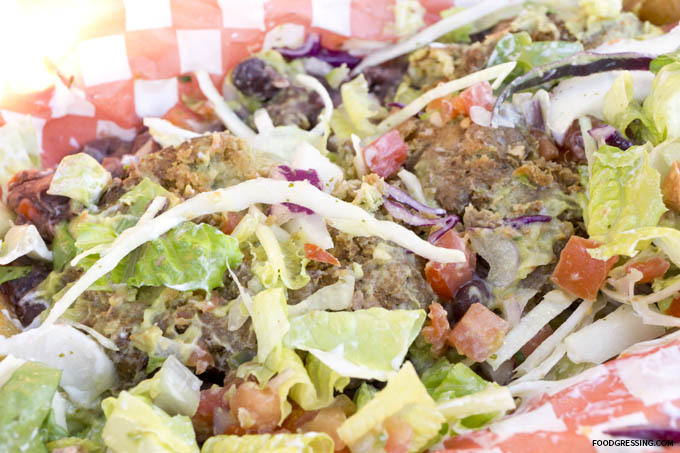 It’s very extensive ranging from burritos, tacos, tortas, rolled tacos, soups, salads and more. It’s casual eatery where prices are reasonable. 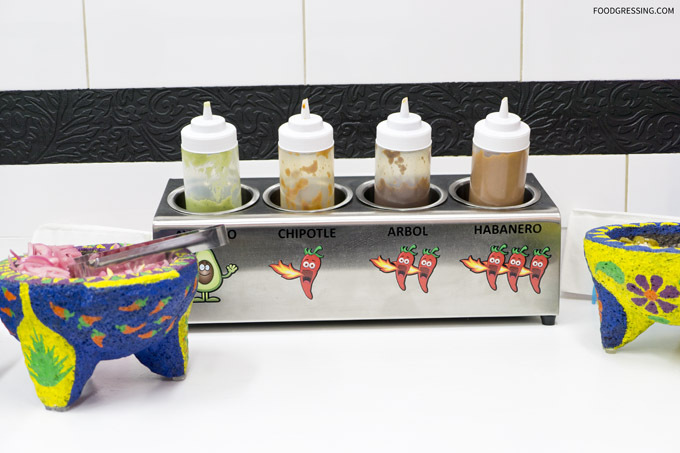 Salsa and Agave’s takeout counter is located at 1223 Pacific Boulevard. They have a few dining tables inside and outside. Since the weather has been good on the times that I have visited, I have chosen to eat at one of their outdoor tables. 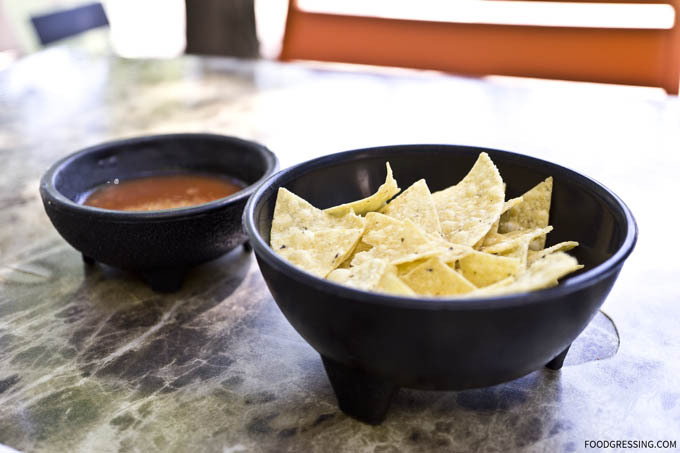 Complimentary tortilla chips and salsa are served when you dine in which I thought was a nice touch. They appear to be using Que Pasa brand tortilla chips because I noticed a few boxes of them in their restaurant. I regularly buy Que Pasa from grocery stores and am familiar with the taste. 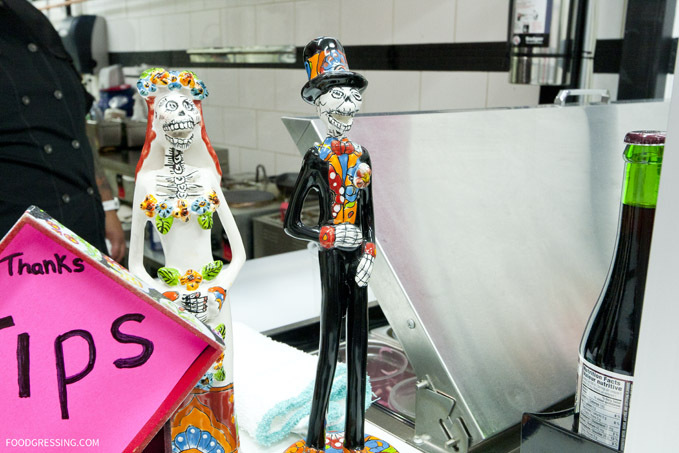 However, I thought that the ones served at Salsa and Agave tasted stale. In fact, if you look on Yelp, a few reviewers have also commented the same. Their salsa was disappointingly mild and watery, and I found similar Yelp comments on that as well. On my first visit, I had the BC Burrito ($10). 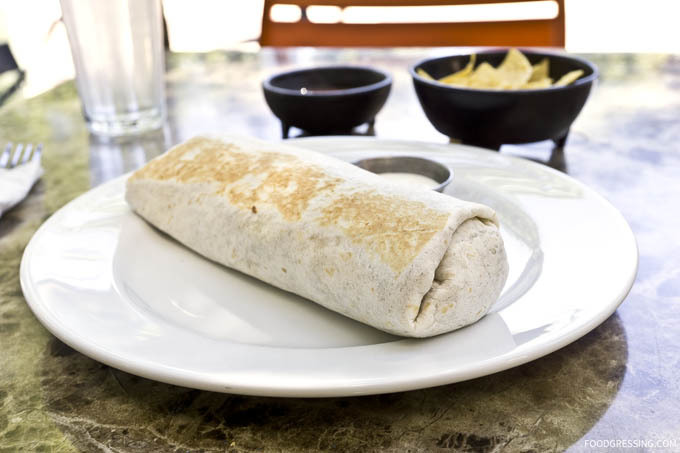 It comes with diced steak, roasted chicken, rice, beans and sliced avocado with your choice of Morita, Red Mexican or Avocado sauce inside. For $10, it was definitely big and filling but the taste was nothing to rave about. It was very bland; the chicken was dry; the steak was tough and the sauce was like a pureed mush. I decided to go to Salsa and Agave a second time to give them another chance. Perhaps I just ordered one of their “bad” items last round. This time, I went with a trio of rolled tacos ($9.50). 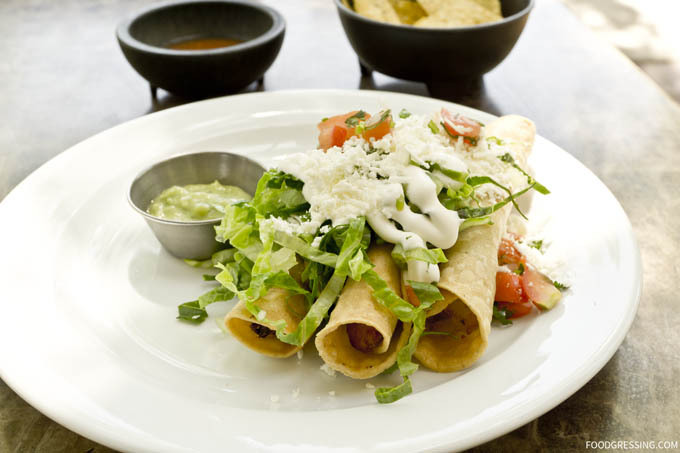 These were stuffed corn tortillas that were pan fried, topped with lettuce, sour cream, tomato, cheese and house avocado sauce. For protein, I chose a mix of papa (potato), pollo (shredded chicken), and carne (shredded beef). The tortillas were pretty crispy on the outside, but again the meat was dry. The best one of the trio was the potato one which was very tender. 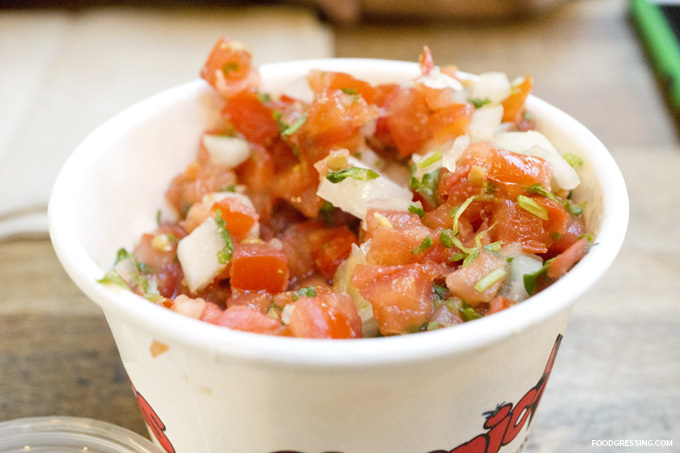 Oh, and if you search for “dry” in Salsa and Agave’s Yelp page, you’ll find it to be a common occurrence in their food. 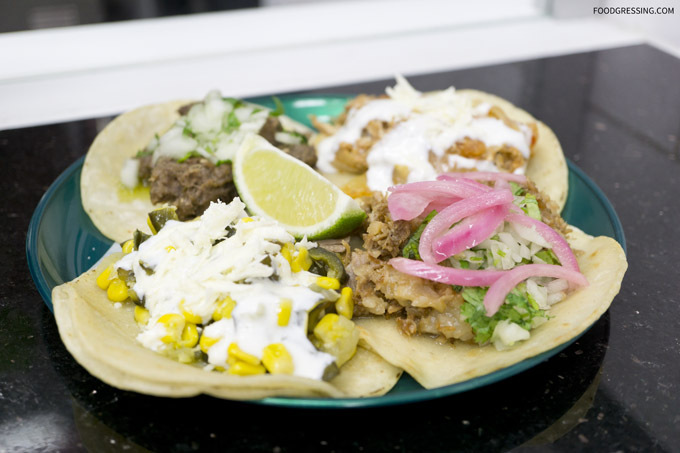 Taco Luis is known as a food stall with cheap and cheerful Tex-Mex eats. There are two locations locally: one at Richmond Centre and the other at Oakridge. 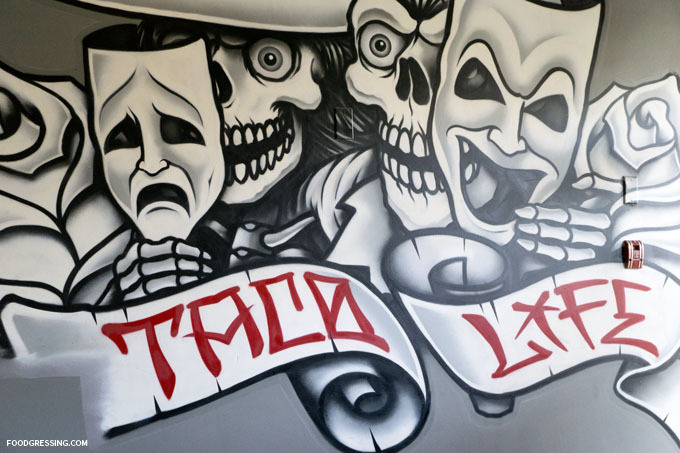 I was always curious about Taco Luis since I would see people coming away with rather mouthwatering Tex-Mex food. 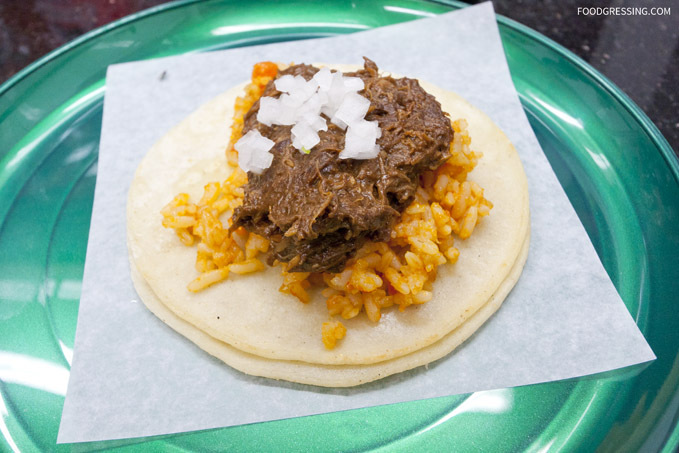 I tried Taco Luis a few times over the last while and here is a review of my experiences. 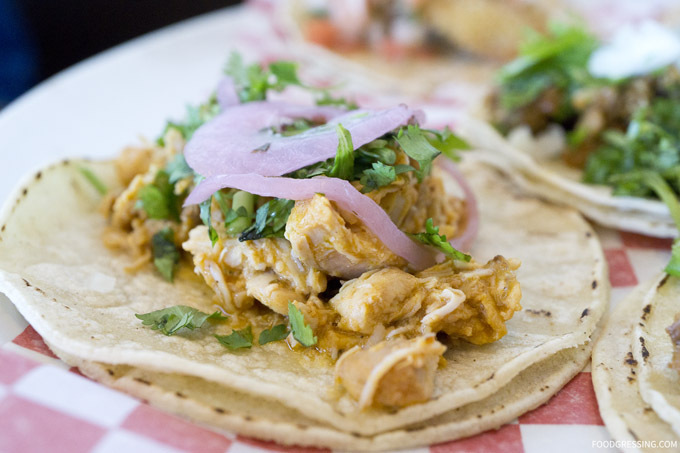 Budget Tex-Mex eats is the name of the game at Taco Luis. You can get a combo for less than $10 including a drink. 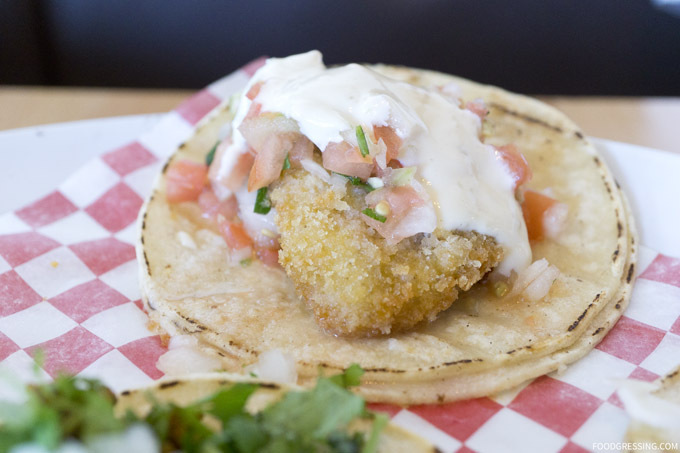 Two tacos with a soft drink and tater tots would be $7.15. 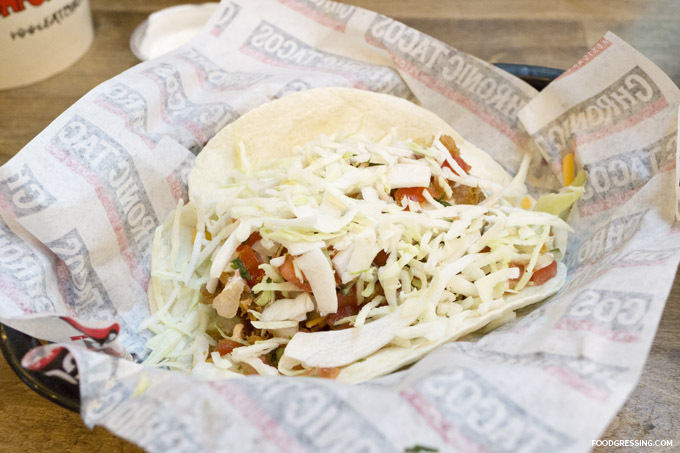 Three stand-alone tacos are $5.86. 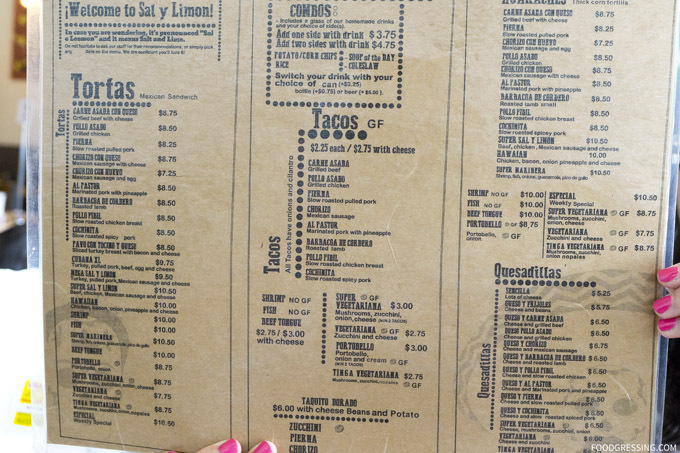 Something to note is that the menu of Taco Luis posted on Zomato is outdated. When I compared my photos of the menu to Zomato’s, I noticed that the prices have gone up. 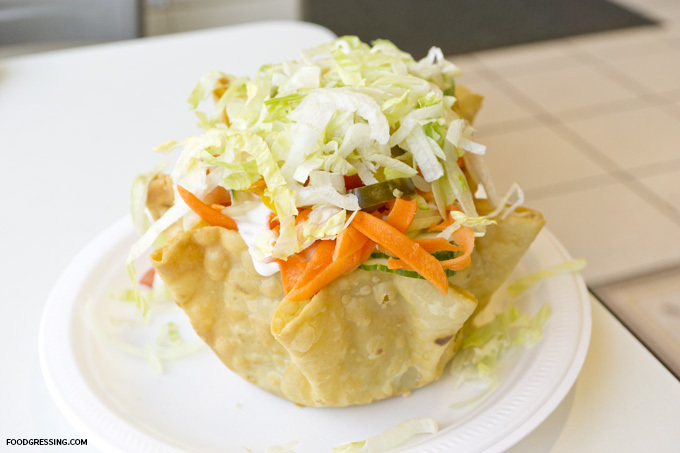 The first time I tried Taco Luis I had the taco salad ($5.86) with chicken. The taco bowl was very crispy and delicious. The ingredients tasted quite fresh and the amount of meat and vegetables was very reasonable for the price. 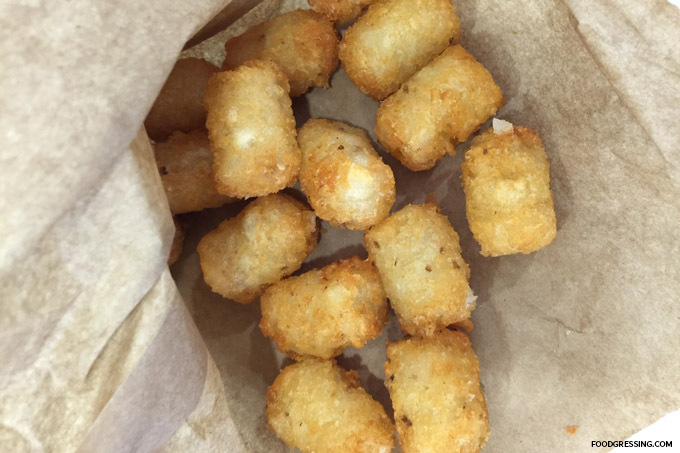 Recently, I had a small order of tater tots ($2.39). I had to wait two minutes for them and they were outrageously tasty for the price. They were freshly fried and piping hot. The tater tots were wonderfully crispy and not very greasty at all. Even though I told the staff person that I was having the tater tots for here, I still received them in a brown paper bag. I would have liked them in a small serving tray. Something to remark on my recent visit to Taco Luis is the customer service. The staff person seemed to have a bit of an attitude and was less than welcoming. As I paid in cash, I noticed that he did not ring in the order through the register. I guess he wanted to save on taxes. When he handed me my order, he asked if I wanted ketchup. Initially, I declined but within 30 seconds I changed my mind. The staff person seemed annoyed and said, “I asked you earlier but you didn’t want.” I was less than impressed. 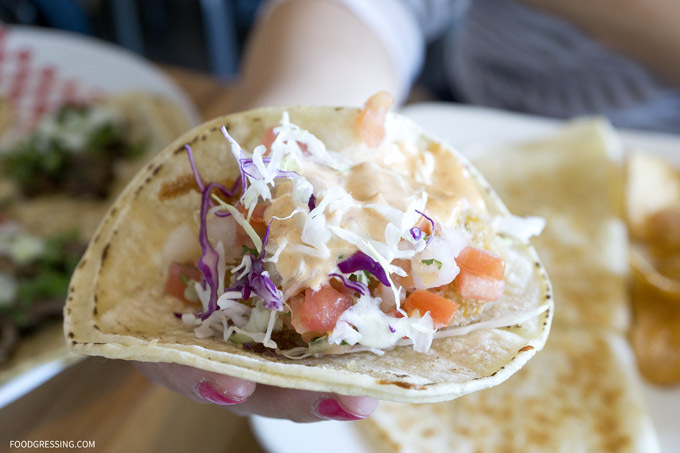 There’s a new taqueria in town. 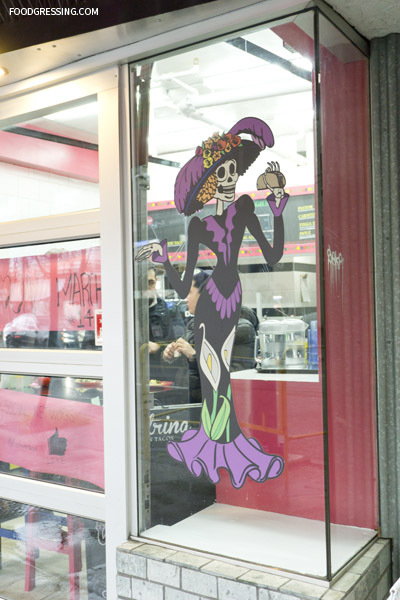 Located at 1187 Denman Street, La Catrina is the newest addition to the local Mexican taco scene. 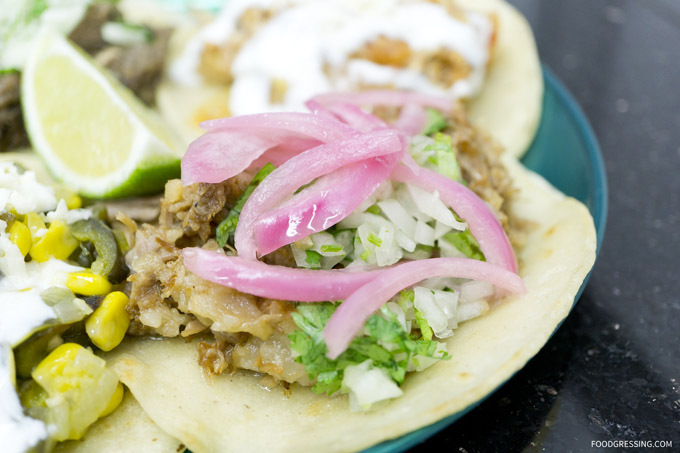 I have tried a few restaurants serving tacos here in the West End, but my experiences have not enticed me to be a regular customer yet. 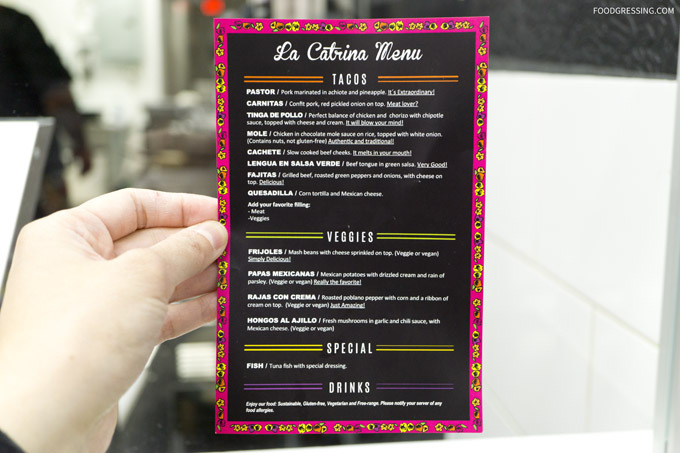 I was excited to learn about this new taqueria opening and was keen to see if they could become my new go-to taco restaurant in this neighbourhood. 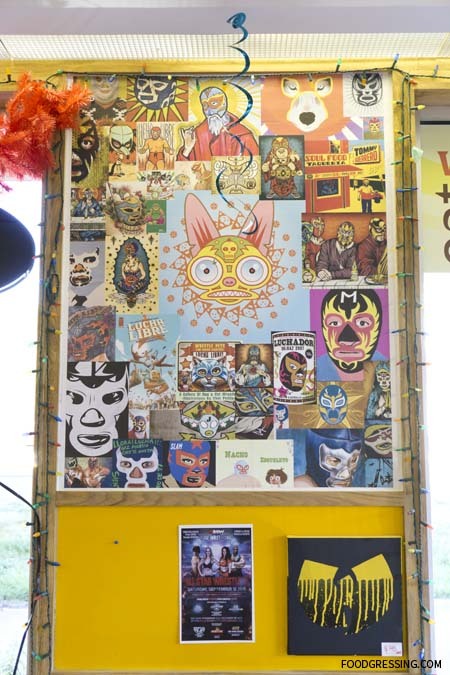 I attended their soft launch party with my husband this past weekend and sampled a few of their tacos varieties. 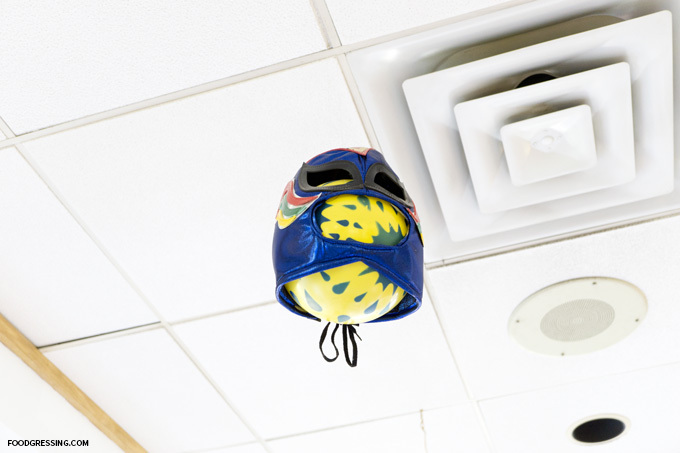 We learned from one of the owners that they are from Guadalajara and that their flavours aim to be closely authentic. 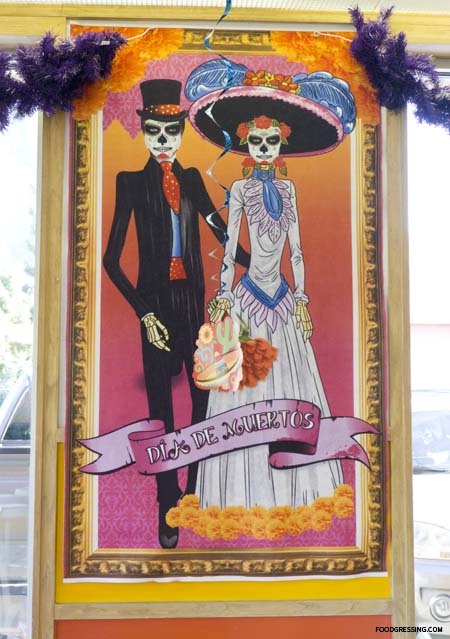 La Catrina serves tacos with meat and veggie toppings that we are familiar with including carnitas (pulled pork), tinga de pollo (chicken), and mole. 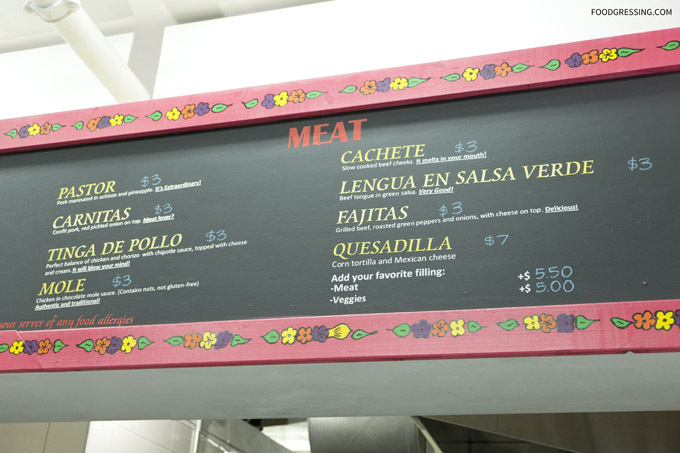 Their tacos are priced at $3 (both meat and taco) which is in line with what is charged at other Vancouver taquerias. 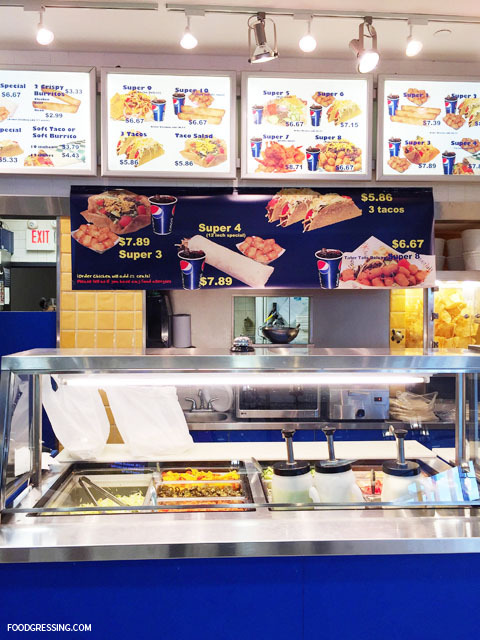 Discount on ordrering multiple tacos is currently not advertised, but perhaps something in the future. 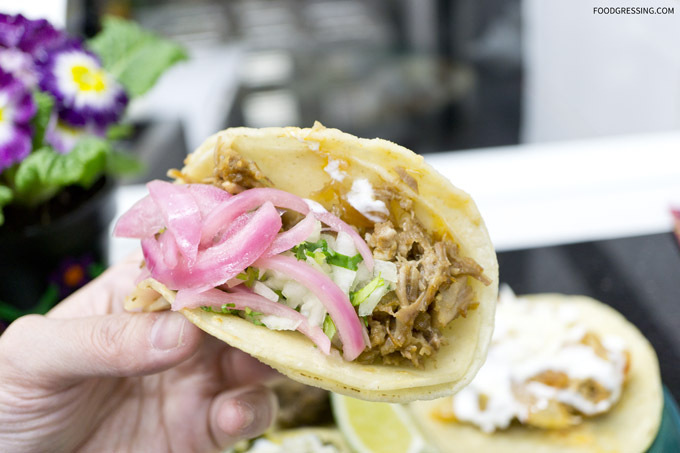 The carnitas (pork confit with red pickled onion on top) did not disappoint: moist, tender, juicy and flavourful. The mole had tender chicken in a smoky, savoury dark chocolate sauce. The lengua en salsa verde (beef tongue in green salsa) again had moist, flavourful meat with a tangy, zesty salsa. The rajas con crema (roasted poblano pepper with corn and creme on top) is one my usual orders and La Catrina’s version was very good. I loved the smoky flavor of roasted poblano chiles. The fajitas had very delicious tender grilled beef with roasted green peppers, onion, and cheese. 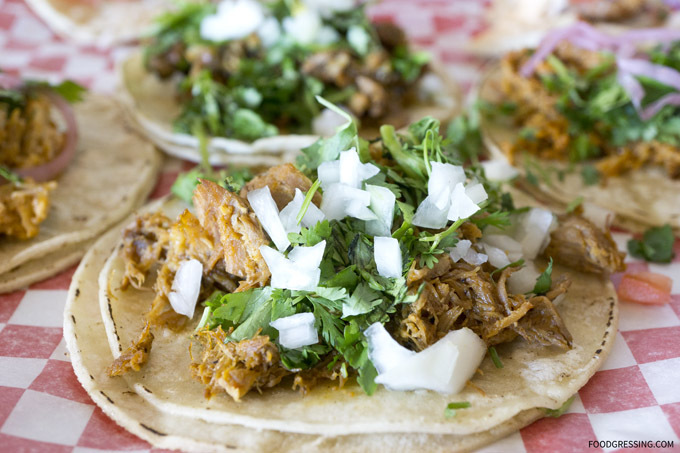 The pastor with pork marinated in achiote and pineapple seemed less sweet than the ones we have had at La Taqueria. The papas mexicanas was had Mexican potatoes with drizzled cream and parsley. The potatoes were a bit hard and could be cooked longer. The tingas de pollo with chicken and chorizo was rich in flavour though on the sour side from the Chipotle sauce. 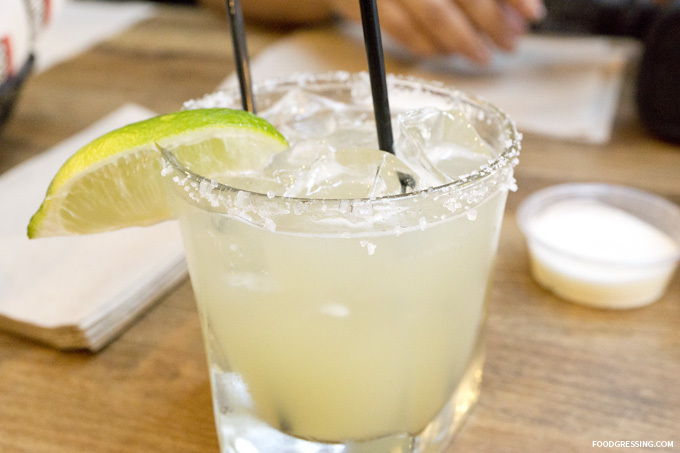 The hortchata was a frothy refresher that nicely quenched the spiciness from some of tacos. Feel free to add as much hot sauce as you want! I really liked that they you could add your own avocado sauce.